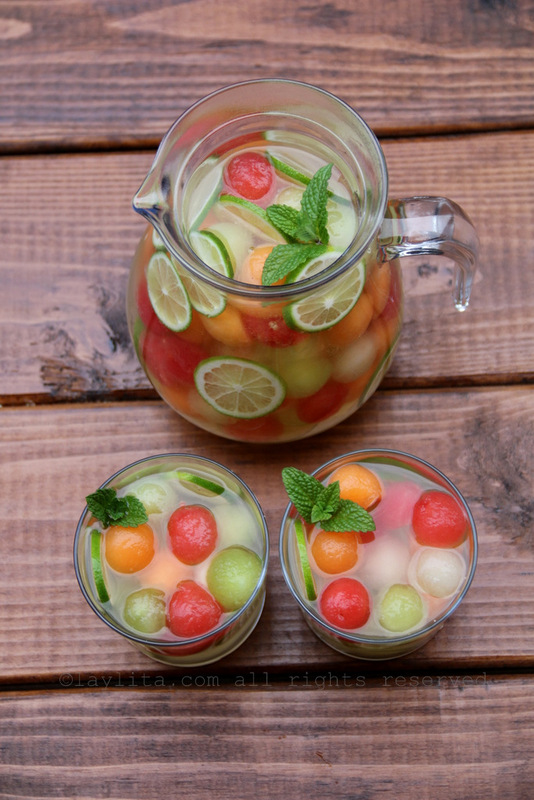 This refreshing and delicious melon sangria recipe is made with Moscato wine, a variety of melons – including watermelon, cantaloupe and honeydew melons – honey, lime, grappa, sparkling water, and mint. 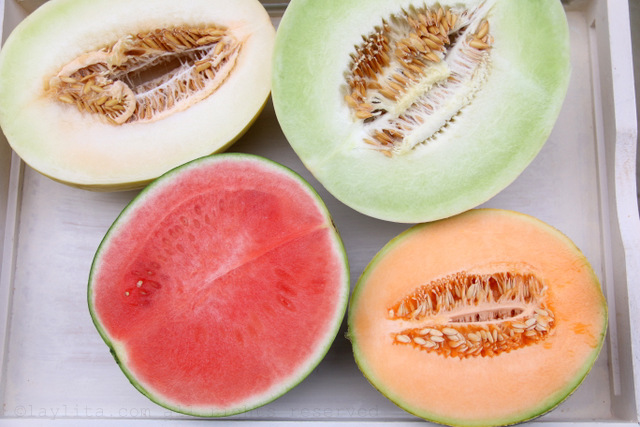 The smell of ripe melons reminds me of warm summer days. 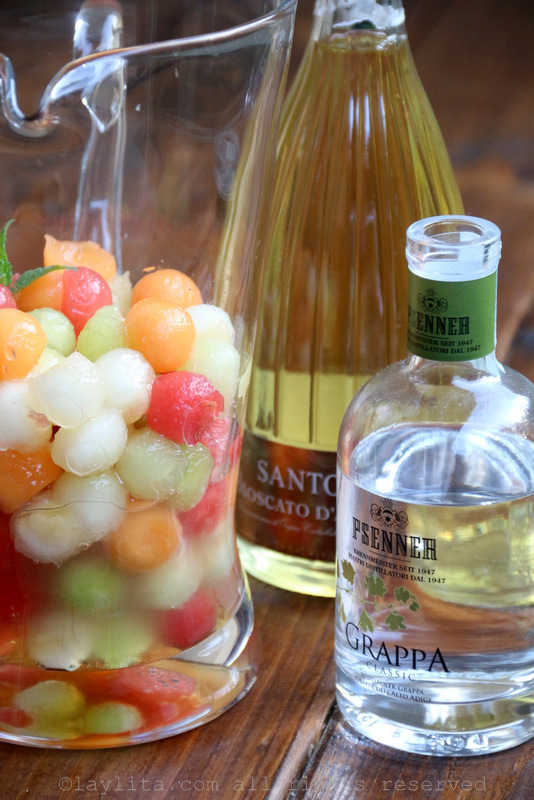 And warm summer days are perfect for sipping Moscato wine or Moscato cocktails. 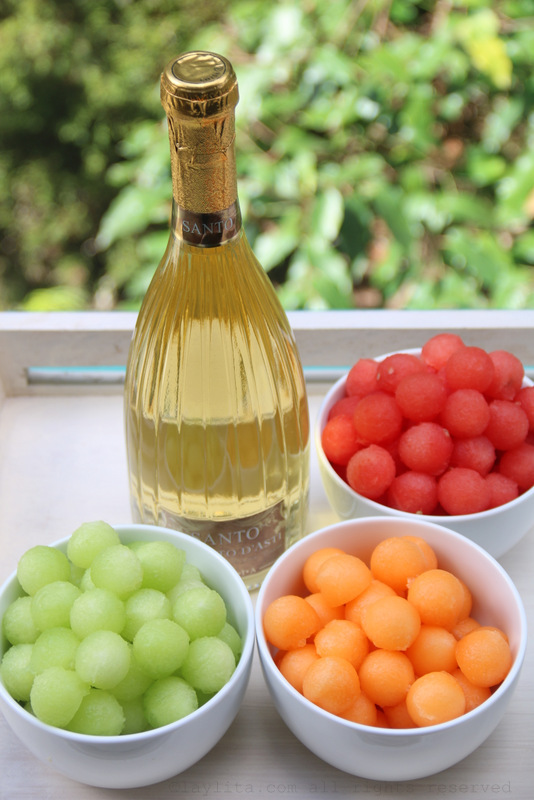 Moscato wine is an Italian sweet wine made from Muscat grapes – yes, those delicious grapes that are very seasonal and are so sweet and fragrant. Well, Moscato wine tastes like the grapes, so if you haven’t tried it yet, I highly recommend it. I also really like to use Moscato wine as a base for white sangrias – it works so well and is already sweet that you really don’t need to add a lot of extra sweeteners. 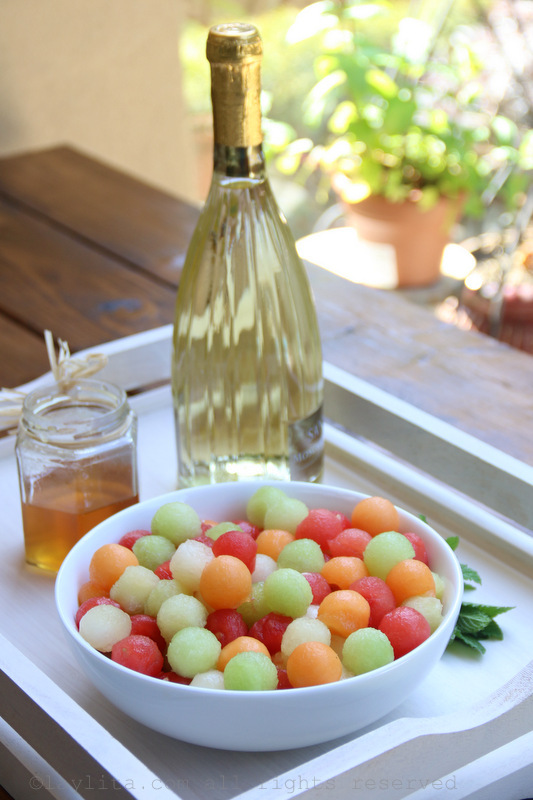 I like to use honey with Moscato sangrias since the Moscato already has a natural honey taste it’s a great match. 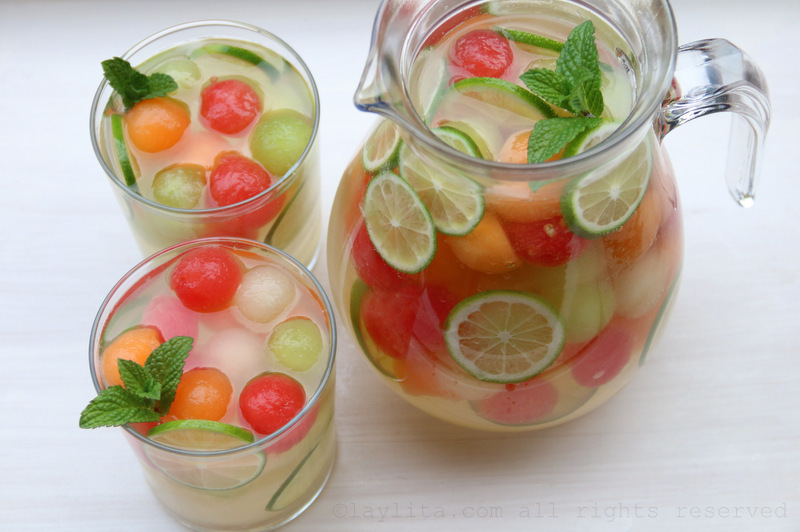 Refreshing and delicious melon sangria recipe made with a mix of melons, including watermelon, cantaloupe and honeydew melons, moscato wine, honey, lime, grappa (an Italian grape brandy), sparkling water, and mint. For a mocktail sangria variation, omit the moscato wine and the grappa, and replace with a sparkling white grape juice and sparkling lemonade. 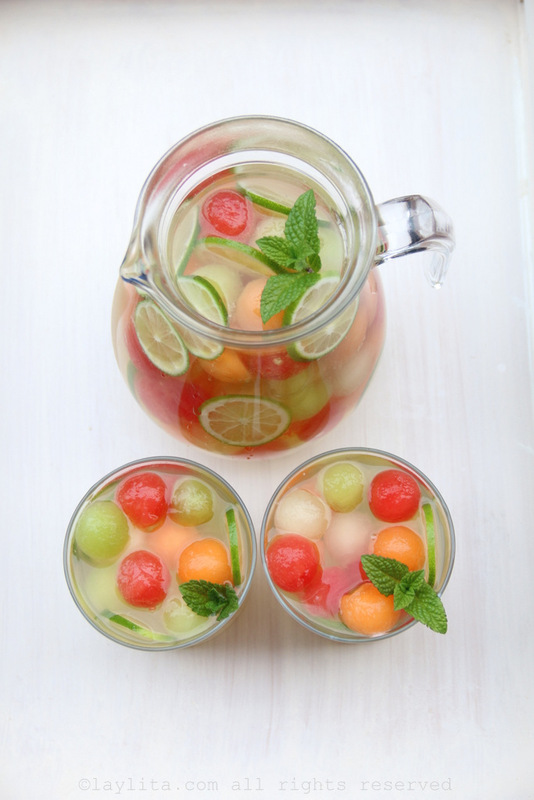 I used melon balls for this white sangria recipe. 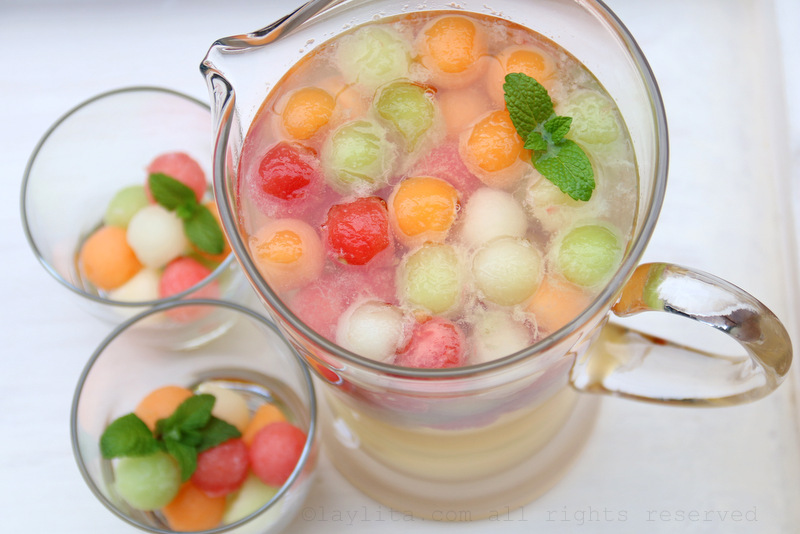 It does take a decent amount of time to scoop out the melon balls, but I love how pretty it makes the drink look. 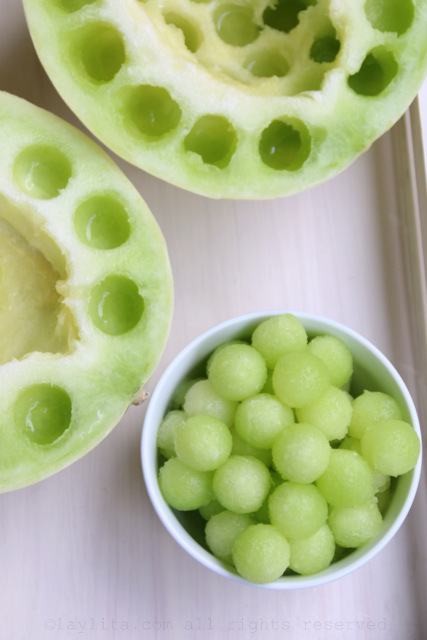 I also froze the additional melon balls to use later as ice cubes. 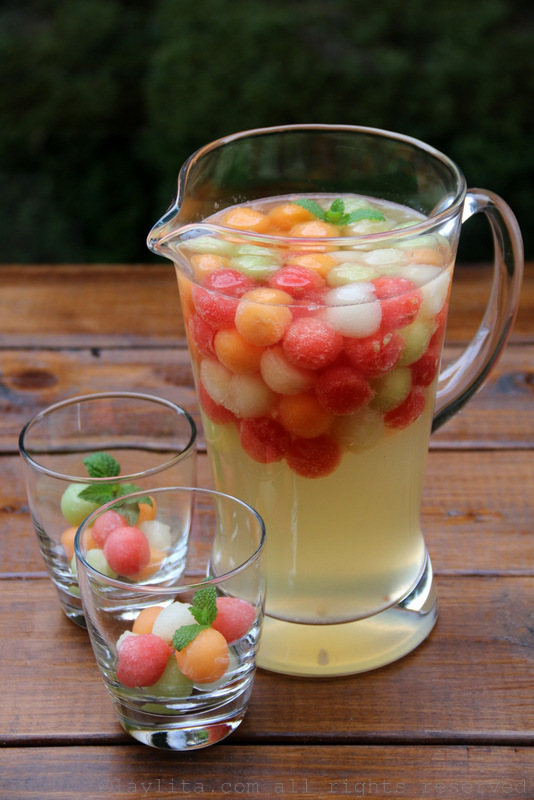 And to not waste any of the leftover melons – what was left after scooping the melon balls, you can use it to make smoothies, cocktails ( a couple of ideas include this watermelon mimosa or this honeydew melon bellini), and even to make a cold melon gazpacho soup. 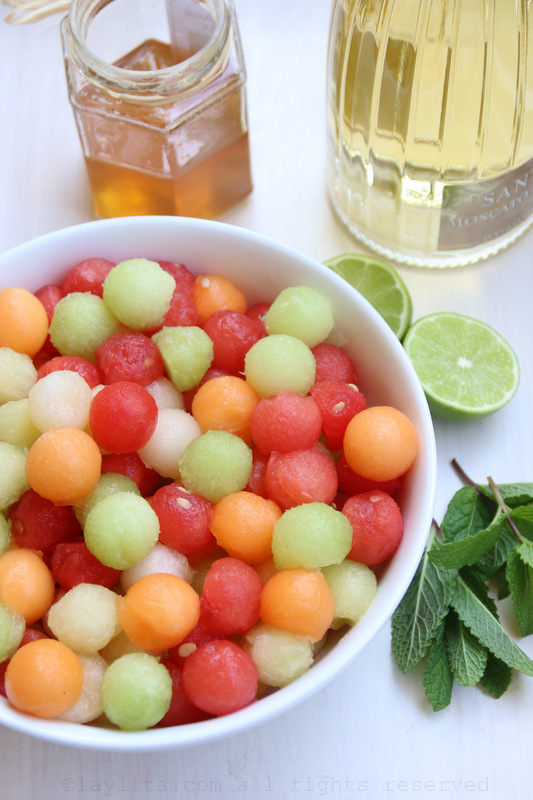 I used a mix of watermelon, cantaloupe, regular green honeydew melon and a white honeydew melon (the skin is yellow) – feel free to use the melon combination that you prefer or that you have available. 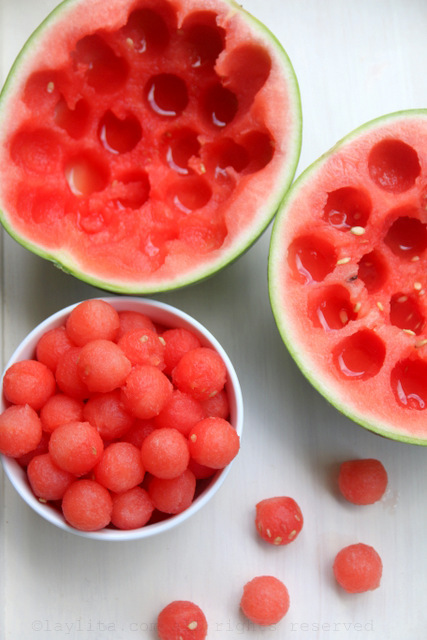 Also, if you’re short on time or don’t have a melon baller, you use melon slices or diced melon for this recipe. 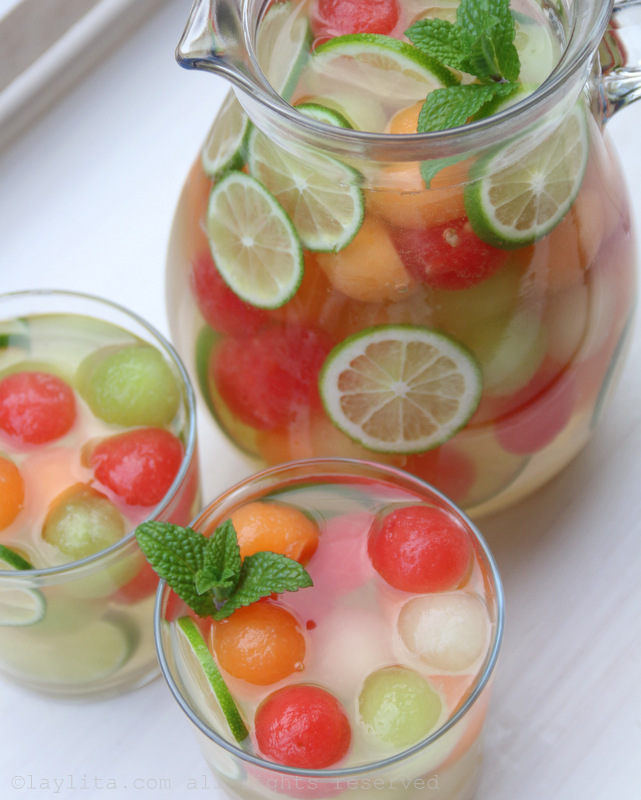 My ideal sangria combination includes wine, fruit, a bit of honey/sugar, some citrus juice, sparkling water, and a small amount of hard liquor. In this case, I used grappa to match the Italian theme with the moscato. Grappa is an Italian grape brandy and is quite strong. Italians drink it as an after-dinner digestive or with their after-dinner espresso. You can find it most liquor stores, in case you can’t find it you can also use pisco – a Peruvian/Chilean grape brandy that has a very similar taste to grappa. 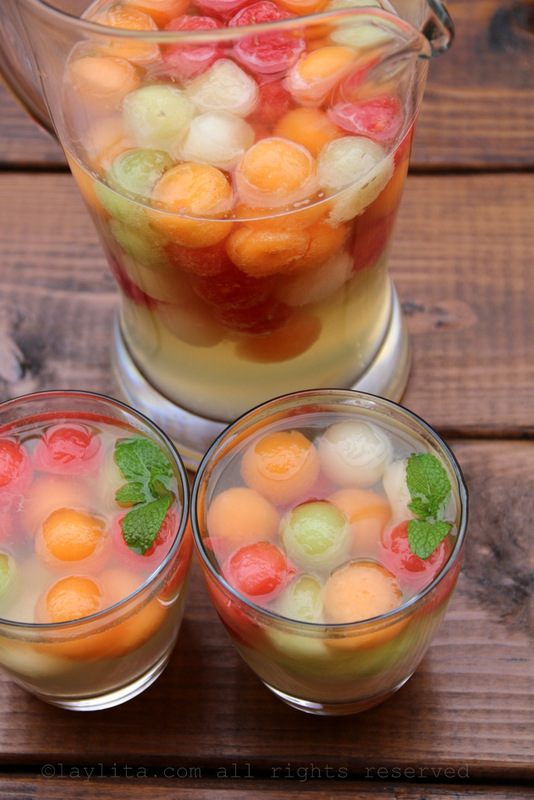 To prepare this melon ball sangria, I mixed the melon balls with some of the honey, lime juice and a bit of grappa and let it rest for an hour or two. Then I add the moscato wine, make adjustments to the honey/grappa and let it rest for another hour. Right before serving, I add ice, garnishes and sparkling water. Of course, if you are in a rush you can mix it all together and serve immediately or let it rest for just 30 minutes. The sangria police might claim that it has to rest for several hours, but it will still taste great, and I won’t judge. Cheers! 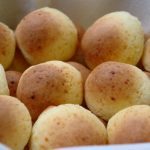 Can you recommend a recipe for the drink without alcohol? I want to make it for the birthday party of my daughter. 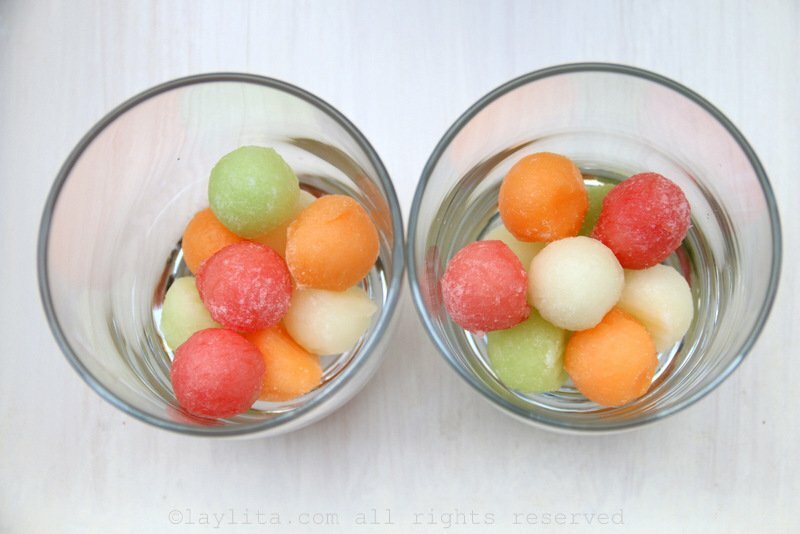 The coloured melon balls looks very very wonderful. I like them. Hi Wampi – Of course, you can replace the alcohol with a mix of sparkling white grape juice and sparkling lemonade. Yes, of course, you can also use rum, tequila, or vodka, or if you prefer a citrus infused cognac like Grand Marnier. If there’s a particular liquor that you like then you can try it with that one. Or you can just omit the hard liquor if you prefer. I just need you to know that you are my new favourite food blogger. 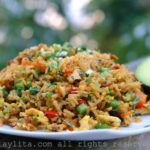 So don’t mind if I copy a few of your recipes to share with my family and friends! Love your site! It looks wonderful. I will make it this summer. Can you share the Muscato brand that you used? I can’t read the label. 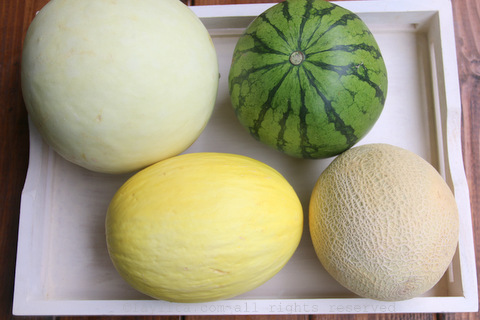 Muscato is one of my favs… I love trying new ones out. The bottle looks impressive. The brand is called Santo and they sell it at Costco. And it is soooo delicious! I made this tonight for the weekend, it looks yummy , i think I might need more moscato though, you didn’t mention what size bottle, so I used a small one , and i think I need to add i more bottle …thoughts????? I used a 750 ml bottle (will update that in the recipe), but definitely you can add more moscato (or more sparkling water or more grappa) according to your preference. Just taste as you add more and adjust based on what tastes good to you (since you -and your guests- will be enjoying it). oh stupid me…must have missed that! Thanx! 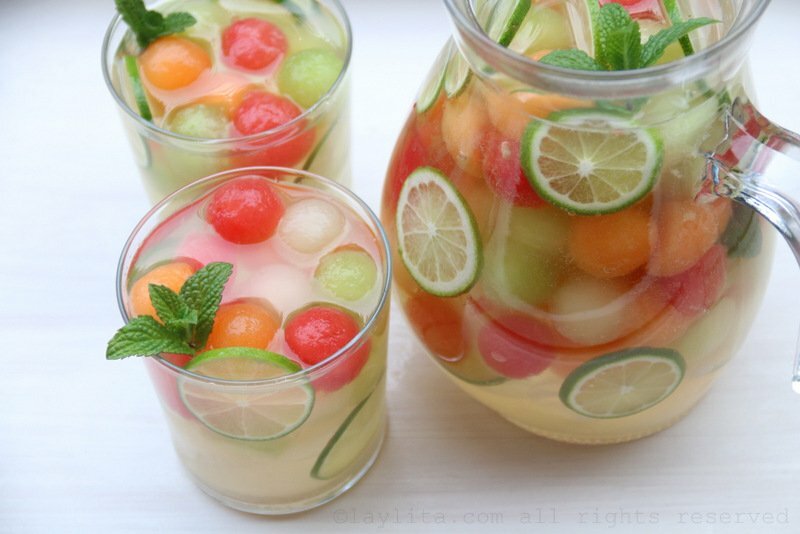 This sangria looks wonderful. I would like to make a non alcoholic version. Any suggestions greatly appreciated. In the Notes section (under the recipe instructions) there is a suggestion for a variation without alcohol.